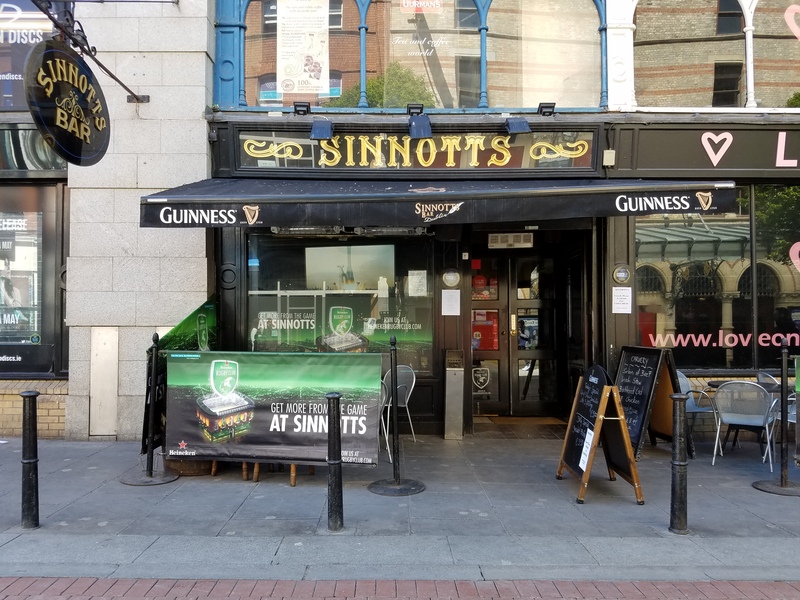 As you may recall from a previous post on my most recent European exploration, I visited the Emerald Isle and spent most of my time in Dublin. According to everyone that’s ventured there, myself included, there is so much to see. Since this vibrant green meat-and-potato-loving country won my heart during my travels, I couldn’t help but round-up a short and sweet little guide on my favorite stops there. Perhaps you’ll find this helpful if you’re planning a visit, and if not, maybe it’ll convince you. I’ll start with Blooms Hotel, where I spent my nights (or mornings) catching some shuteye. 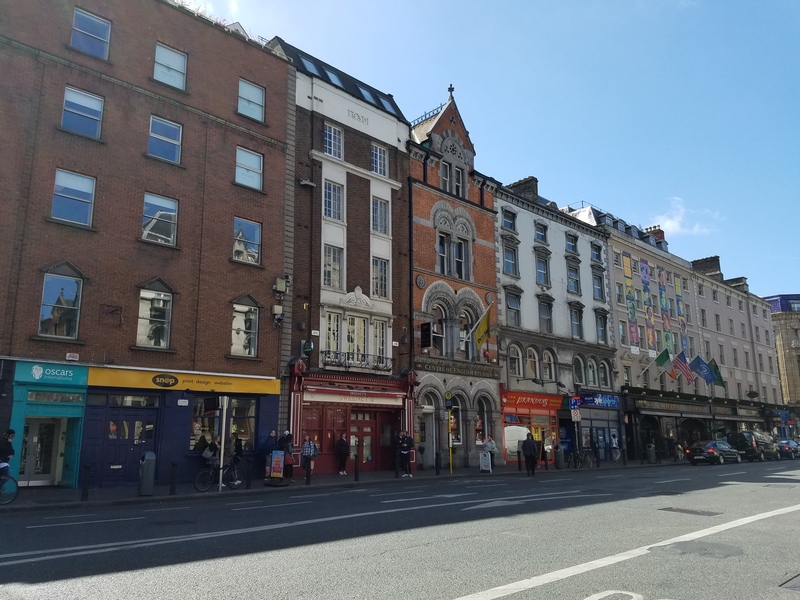 Located on Anglesea Street in Temple Bar, an area on the south bank of the River Liffey in central Dublin, it’s a fantastic place to stay if you want to be in the center of the action. 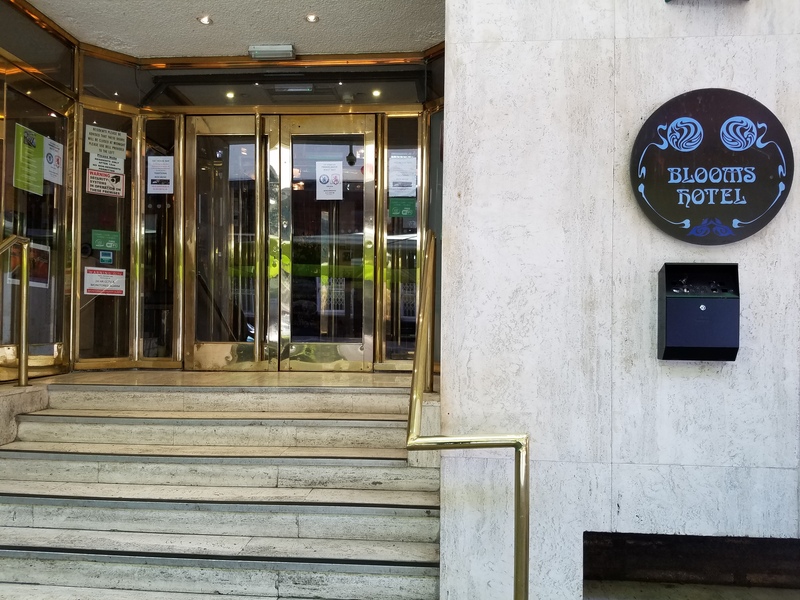 The hotel is nestled in one of the city’s most busy and tourist-crawling places, so it’s not the quietest location (and this is Dublin we’re talking about!). 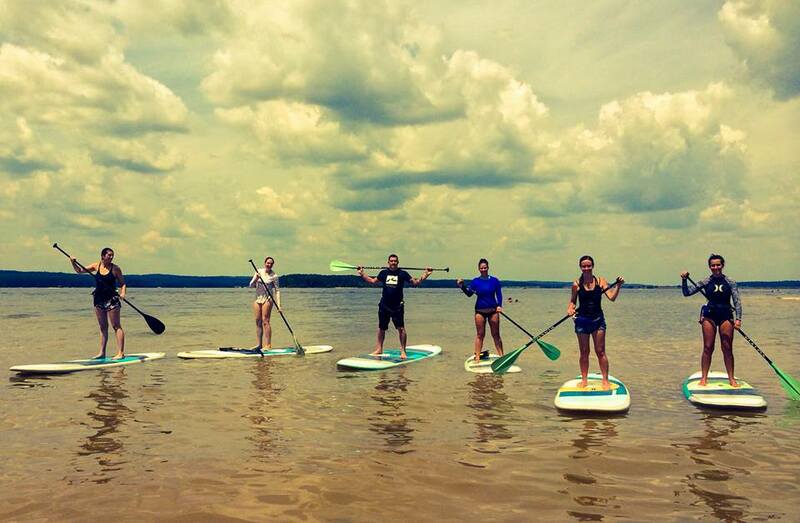 However, if you want to be in an energetic place that’s pretty darn walkable, this will do. But if you went real Irish and don’t feel like walking while hungover (don’t worry, the Irish aren’t offended by this and have a huge sense of humor), there’s a bus station right around the corner, and the buses go all around and out of the city. The stops, bus numbers, and wait times are listed, so it’s an easy system to follow. As for Blooms’ rooms, they’re clean and spacious, and the rates are average, I’d say. Although there was no thermostat in my room, so when it got warm, I opened the window, and that cooled the room off quickly. The hotel is also attached to a bar, Vat House, and if you’re of age, you get a free drink coupon upon check-in (at least that’s what happened in early May 2017). This leads me to my next point! I popped in and out of a number of pubs during my stay, but my favorites are easy: Gogarty’s and Temple Bar. Gogarty’s has delicious fish and chips, along with glasses of smooth Guinness to accompany the already fabtabulous flavor. 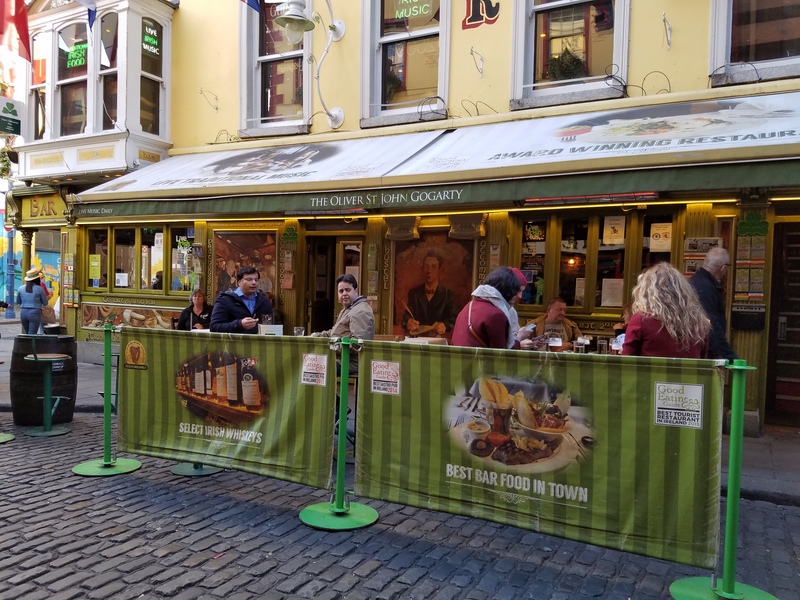 With live Irish music (accents and all), plenty of space, and chatty locals and tourists abound, this hot-spot draws a fun time. You can enjoy the best of live traditional music every day, no matter when you stop in, because the tunes are flowing from 1:00 p.m. to 2:30 a.m. 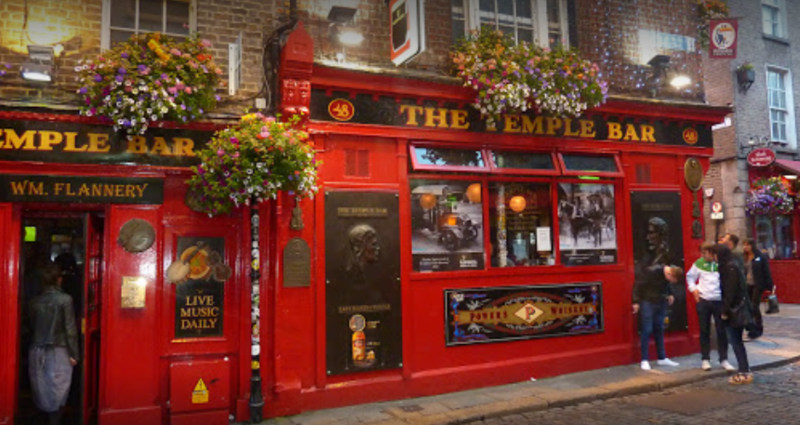 I forgot to snap a photo of Temple Bar, so this one’s from the bar’s website. Hi guys. Hope you don’t mind me using this. As for the Temple Bar pub, it’s a special place, and it lives up to its name, being dubbed after the area itself. The Temple Bar is spacious, but I found it to be packed, sometimes a little too packed, during the night and early morning hours. So that says a lot! The drinks here never end, and the live music will have you moving in a crowd of future friends. Most people, bartenders included, are approachable and chatty, and no matter who you are, you’re welcomed and will fit in in an instant. I’m not sure this place knows what sleep is (it’s also a location where people stop to take pictures/selfies that you can have fun photo-bombing), but it’s open from 10:30 a.m. to 1:30 a.m. Mondays through Wednesdays, 10:00 a.m. to 2:30 a.m. Thursdays through Saturdays, and 11:30 a.m. to 1:00 a.m. on Sundays. Gallagher’s Boxty House and Sinnotts all the way. First thing’s first: Gallagher’s Boxty House is always mobbed, and if you don’t want to wait an hour or so, make reservations. This restaurant is small but its food has some huge flavor. On my first visit (yes, first visit, meaning I went more than once) I had the Kilkenny trout with potatoes, and it was so marvelously tasty that trying other dishes was a must. I also sampled the corned beef and cabbage and shepherd’s pie (which is what the two people I munched with ordered) and they got two thumbs up. The next night at Gallagher’s Boxty House (yes, less than 24 hours later), I had the chicken boxty and was beyond satisfied. I didn’t even know what a boxty was, but oh heck yeah, now I do! For those who don’t know, a boxty is an Irish potato pancake, and they wrap it around meat, fish, or vegetables. 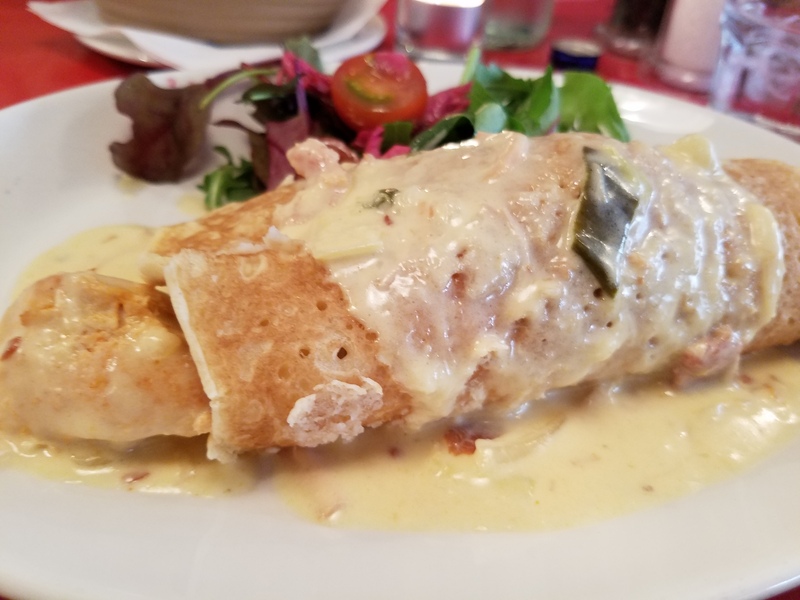 Here’s the description of the astonishing boxty I had the pleasure of devouring: “Free range Irish chicken in a smoked bacon & leek cream sauce, wrapped in a boxty pancake.” It’s magical and tastes like a pot of gold on a green mountain blessed by leprechauns above the ocean and I can’t recommend it enough. But we can’t forget about Sinnotts! Recommended by Connor the bartender at Temple Bar, because the locals know all the secrets, this place rocks. It has a cafeteria-like set-up — you grab your plate and stand on line and stack up on food that looks good from the people on the other side of the counter — but don’t let that fool you (there are lots of restaurants and pubs like this in Ireland), because the food is roll-your-eyes-in-the-back-of-your-head good. 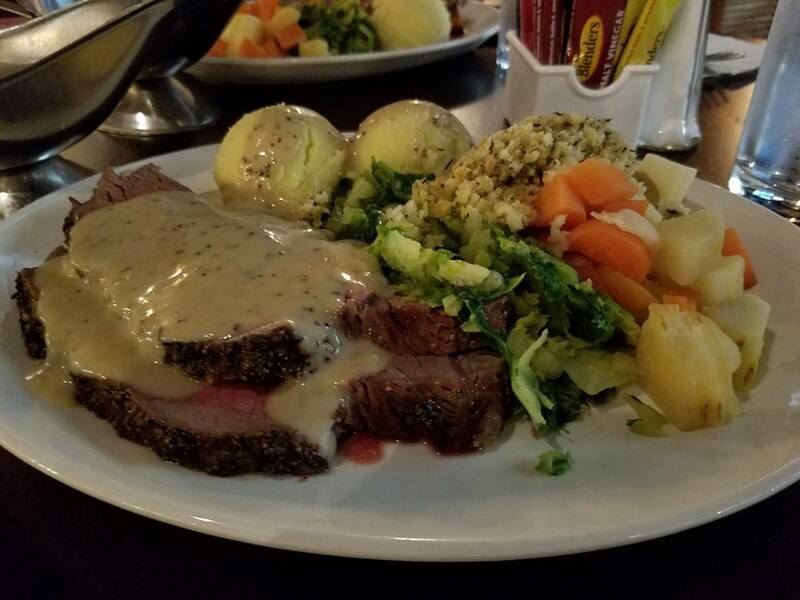 With a sports pub feel, Sinnotts has a laid-back atmosphere, which goes along perfectly with the fresh roast from the carving station swimming in pepper gravy. I also packed on two piles of mashed potatoes, tasty cabbage, airy stuffing, and colorful vegetables. You get a lot of food for a fairly low cost. Note: I’m pretty sure the carving station is open from 12:00 p.m. to 2:30 p.m. If you’re staying in or are visiting the Temple Bar area (which is a must-see itself), I recommend touring the Trinity College campus. There are tours set up that cost you a few euros, but you can also wander around campus on your own, which is the route I chose. If you’re into literature or are a fan of Harry Potter, the library here will excite you. 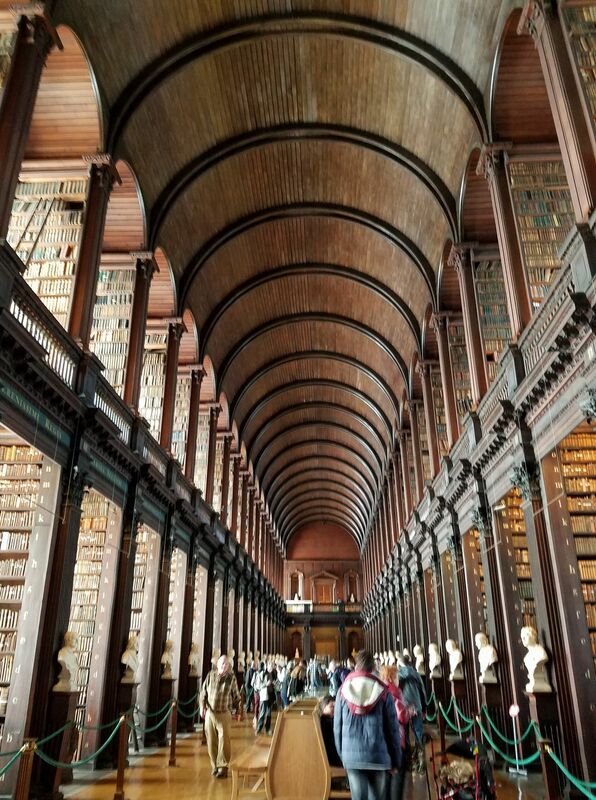 It’s the largest library in Ireland and is the permanent home to the Book of Kells. Dubbed the Long Room, which was built between 1712 and 1732, it houses 200,000 books. The Long Room also holds one of the last remaining copies of the 1916 Proclamation of the Irish Republic. History is alive and well here. The Guinness Storehouse. 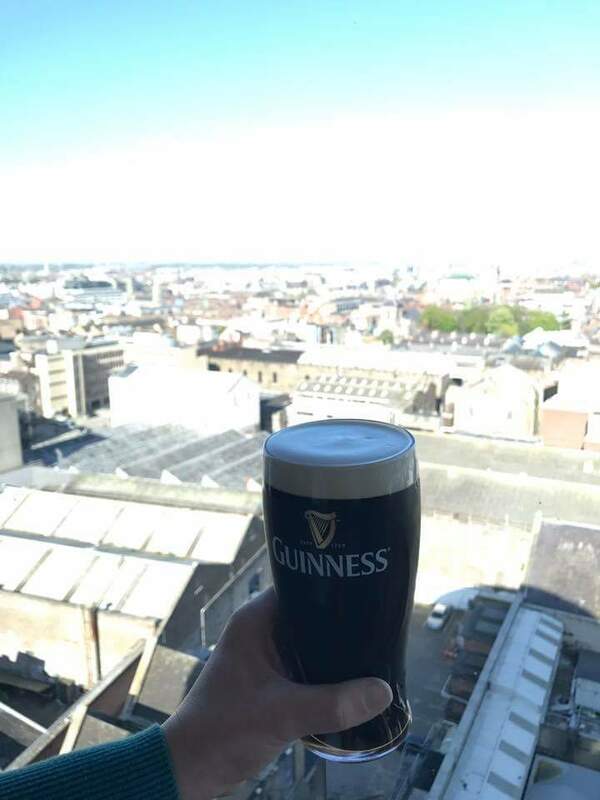 Know that you don’t have to drink alcohol to enjoy the beautiful views from atop the Guinness Storehouse, but the two fit together quite well. No matter what, the sights of this city are amazing and being at this high point is worth the visit. Plus, before you get up there, you get to learn about the calculated work that goes into making Guinness. It might be the only thing the Irish take seriously! The hand, Guinness, and photo of Sherri, a fellow American I met in Ireland. 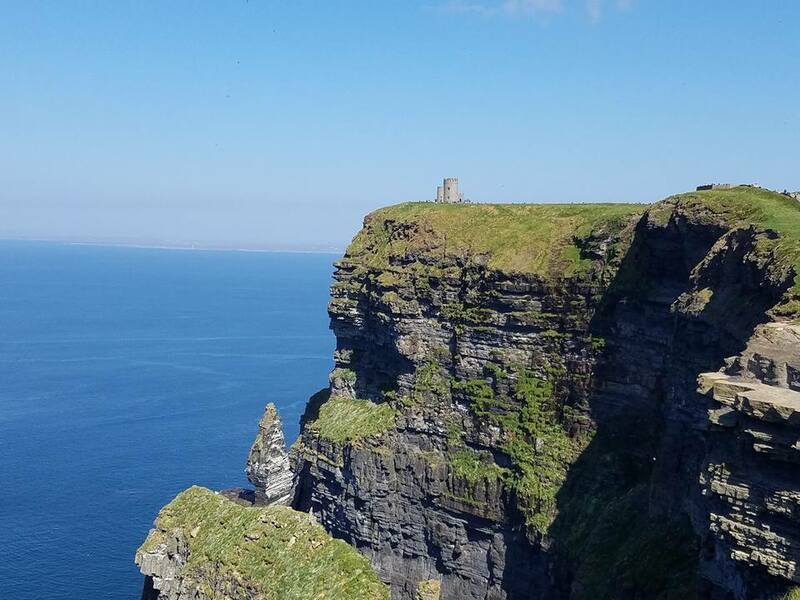 I adored Dublin, but I cherished the Cliffs of Moher just the same. I went on a breath-taking ride to the Irish countryside with Irish Day Tours, who I highly recommend traveling with. We left early in the morning, around 7:00 a.m., and we didn’t get back to Dublin until about 7:00 p.m. If I’m remembering correctly, it took us about three hours to reach the Cliffs of Moher, but that was with a stop at a gas station (which had a creepy life-sized cutout of the Obamas) for snacks and toilets. On the way back, we stopped in Doolin for lunch (delicious Irish stew), which is alive with greenery and sheep and cows, and then we wandered to the pretty riverside city, Galway (Gino’s Irish gelato is delicious on a bright, breezy day). So about the Cliffs themselves: they’re enormous and powerful and natural and stunningly remarkable. Seeing images of the Cliffs are a thing of beauty, but you have to be there to get the full awe-ful affects. I felt connected with the Earth there, and at peace. The Cliffs also made me feel risky and I just had to swing my feet over. Have a look! 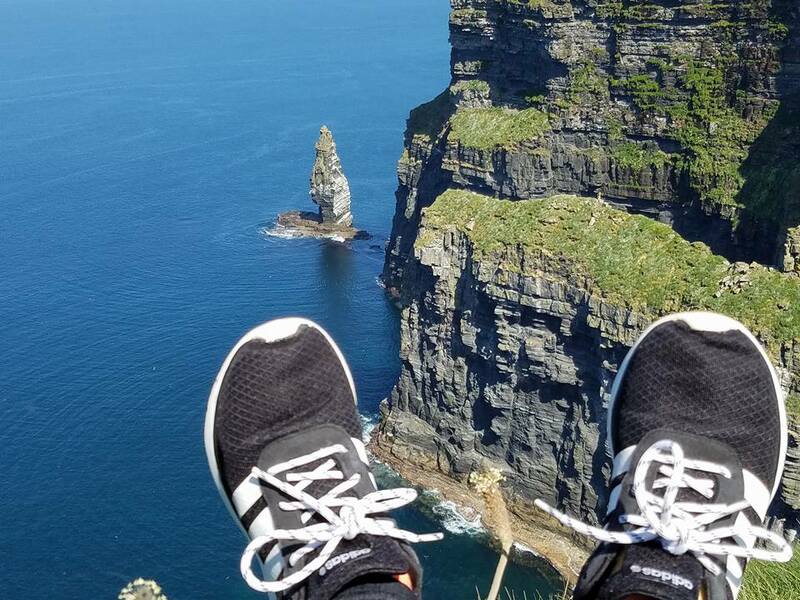 I don’t recommend what I call the “Cliffs of Feet” to everyone, especially if you’re afraid of heights. Of course, always use caution when venturing to the edge, even if you’re a topnotch daredevil. If it’s windy, stay away, no matter what. Fortunately, we had a sunny, hot day to frolick around in. And there you have it, lads and lassies. Those are my top picks from my three-and-a-half-day visit to Ireland. If you have any tips or comments you’d like to share, post them below.